Dulili desperately needs more inhabitants. There aren't enough young people left in the village and it's time to find some new residents. The locals have a plan though. They're offering cheap houses to newcomers who need a fresh start. When Adele sees the ad she decides it's exactly what she needs. Her daughter Ali doesn't speak and she has no idea why. She thinks the peace and quiet of the village will be good for her. They don't have much, but work is part of the village plan, so she and her daughter will have a roof over their heads and food on the table. Tom has a house in Dulili, but he doesn't intend to stay. His grandmother is one of the residents who are actively trying to bring some life back into the village. Tom has a lot of problems and is trying to find a way out. When he meets Adele and Ali he instantly likes them and Ali seems to trust him. He wants to help them, but he isn't in Dulili to stay. He's becoming very friendly with Adele, but that's the last thing he wants. Will he be able to walk away from love when the time comes to leave the village? A Heart Stuck On Hope is such a wonderful and warm story. I love the idea behind A Dollar for a Dream, it's so kind and lovely. Adele needs a fresh start. She's a brave woman and she's easy to get along with. She worries about her daughter. Ali has stopped speaking and she wants to find out what's behind it. She does everything she can to make her daughter happy. She's a strong and independent woman. Tom is there to help her with some work and they become good friends. He doesn't let people in, but Adele is different. They have a special connection, only he isn't ready for something like that. It was interesting to read about their relationship and they're sympathetic main characters. I couldn't wait to find out if they would get their happy ending. I love Jennie Jones's writing. Her descriptions are vivid and she makes her main characters come to life very well. The setting is amazing. It's easy to picture the beautiful village and its inhabitants. 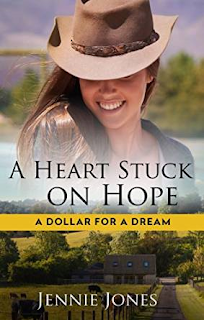 A Heart Stuck On Hope story is romantic and hopeful. I really like Jenny Jones's books and highly recommend this one, it's a sweet and heartwarming story. It's nice to read about a mom who cares so much about her daughter. It would worry me if my daughter stopped speaking! This sounds sweet and engaging! I'd like to see how Adele's & Tom's (& Ali's) relationship progresses.